The 2013 Toyota Camry and Prius v finished in 17th and 18th place respectively on the Insurance Institute for Highway Safety's latest test of 18 mid-size cars. The Toyota Camry and Prius v may be two of the most popular vehicles available today, but that doesn’t mean they’re the safest, according to a new test by the Insurance Institute for Highway Safety. In fact, the 2013 Toyota Prius v hybrid scored dead last amongst 18 cars tested, with “poor” ratings in five of seven categories. Scoring only slightly better was the 2013 Camry, which finished next to last. During the testing, both models were susceptible to multiple infringements, according to the IIHS report. Not only did both vehicles incur front-end driver’s-side wheel damage, but it also sustained passenger cabin damage. In particular, the institute’s test found “significant” intrusion in the Prius v test and “high force” measurements to the crash test dummy’s legs and feet. In the Camry test, the crash propelled the front wheel into the footwell, twisted the windshield pillar and pushed the parking brake out of place. IIHS’ new crash test is designed to simulate a collision in which the front corner of a car hits another car or solid object. Specifically, 25 percent of a car’s front end on the driver’s side strikes a 5-foot-tall unyielding barrier at 40 mph in the test. The IIHS crash test is more rigorous than the U.S. government test, which replicates a collision where two vehicles or objects meet head on. 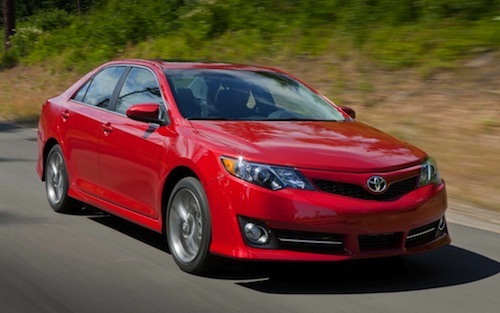 According to IIHS, neither the 2013 Toyota Camry or Toyota Prius v are suitably equipped to handle front corner impact. "The Camry's driver airbag and side curtain airbag deployed, but the steering wheel moved so far to the right that the dummy's head made only minimal contact with the front airbag. The side curtain airbag didn't extend far enough forward to help prevent the dummy's head from hitting the instrument panel," said IIHS in its report. "In the Prius v, the side curtain airbag deployed too late in the crash to offer protection." Adrian Lund, IIHS president, added that Toyota’s engineers have a great deal of work to do to match their competitors. Toyota rivals like Honda, Ford and Nissan have already begun redesigning vehicles to protect passengers in front-corner impact crashes. Toyota responded to the discouraging test results stating: “With this new test, the institute has raised the bar again, and we will respond to the challenge.” The automaker also indicated that the Camry and Prius v have scored well on other crash tests and are still rated as “Top Safety Picks” by the IIHS. The Toyota Camry is currently the best-selling midsize car in the U.S. Toyota has sold 373,479 Camry vehicles as of November, a 35.8 percent YTD increase over 2011. In comparison, Toyota’s dominance of the hybrid market has been slipping lately. In fact, the all-new Ford C-MAX hybrid outsold the Toyota Prius v, 3,182 units to 2,769, in its first full month of sales in October. Furthermore, Ford sold a total of 4,848 C-MAX hybrids in November compared to a total of 4,456 Toyota Prius plug-in and Prius v hybrids.